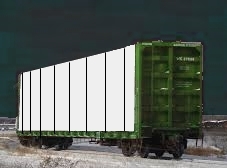 Flexpak has several different railcar cover designs for shipping lumber, wood products, and composites by rail. The Heat Sealed Railcar Cover manufactured at Flexpak provides a heat seal along the seams to provide maximum protection from moisture when shipping by rail. The Heat Sealed Railcar Cover manufactured at Flexpak has all the same specifications as other railcar covers manufactured at Flexpak. The capabilities to make a heavier, more durable railcar cover, are an option by using premium woven plastic wrap material. Most customers will use a 76’ x 32’ railcar cover when shipping by rail. Flexpak can manufacture a cover with heat sealed seams using different measurements if the customer needs less or more material in the design. Occasionally the shipping process may require different size specifications for the cover, and Flexpak can provide a custom solution in the Railcar design. Plain and printed Heat Sealed Railcar Covers are both possible. Flexpak stands by the standard that if one is going to ship a moving billboard down the rail, the possibility of high advertisement should be utilized. See the Printed Railcar Covers page for more information on printed covers. Contact Flexpak at any point to discuss how Heat Sealed Railcar Covers may be an effective means to protect your product when shipping by rail.